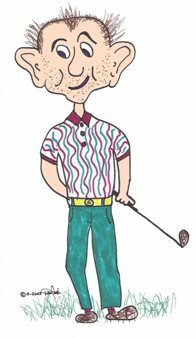 A series of cartoon characters give humorous golf tips and opinions. Bet you're surprised to find a dorky-looking little guy like me here, but admit it - I really am kinda cute! Yes, I’m Scruffy and I want to tell you a bit about myself and why I'm on this website. It all started with my dad who is obsessed with golf. He went to the US Open one year and spent an entire day looking through binoculars at the balls the pros use. He noticed that they use dots to mark their balls. Made him wonder how they knew which dots were theirs. That was just the beginning. I have become the main character in a continuously growing series of unique and amusing personalities known as Scruffy & Pals. My pals and I are all distinct in appearance, personality and our approach to the game. Each of us has special interests and expertise and we want to share information, tips and even our opinions with you. Our clean humor and common sense will add a new dimension to your game. Come on - let me show you around our site and introduce you to my Pals. Click on the Scruffy & Pals icon below.